Maximize every inch of space in your bathroom without sacrificing style and functionality by checking out this list of unconventional alternatives to the regular bathroom door. Decorating the bathroom presents several challenges that make choosing a bathroom door tricky. Most bathrooms are small so homeowners need to pay special attention to the size, installation, and even the direction to where it should swing open. It’s imperative that the door doesn’t block bathroom utilities such as the toilet, sink, or cabinet. Homeowners should also be careful in choosing the type of material for the bathroom door. High levels of moisture and humidity in the bathroom can easily damage certain types. Aside from separating the bathroom from other parts of the house and affecting the ambiance inside, bathroom doors can serve a decorative purpose. Because it’s one of the first doors we open in the morning and the last one in the evening, the bathroom door should be pleasantly stimulating. Check out the list below for unconventional alternatives to the traditional bathroom door. Barn doors are rapidly becoming the most popular alternative doors that people put in their homes. If you are looking for a door that will stand out, then using a barn door is a good idea. These doors can definitely help you add to the down-home charm of your home. They have a very rustic feeling, and it is something that so many people enjoy. There are a lot of different styles that you can choose from when you go this route, too. You will find many colors and finishes when you look at barn doors in a retail setting. Some people prefer to go with reclaimed wood in order to cut down on wastefulness. Whatever you want to do should work out well, as long as you like the country look. Installing a barn door should not be too difficult at all. You will be able to enjoy a very nice bathroom door that looks different from a traditional option. This helps your home to have a certain unique appeal that is hard to deny. You will be able to pick from several options and can even use reclaimed wood if you are an environmentally-conscious individual. It might feel a little odd to use a barn door for your bathroom at first. Everything really depends on how well this bathroom door is going to match up with the rest of the house. If you have décor that suits the barn door, then everything will appear very natural. This is just a door that works well with a specific style, and it may not suit your needs if your home looks modern in any way. Pocket doors have proven to be popular alternatives to more traditional doors. People make use of them throughout their home, and they have become very commonly used as closet doors. It is also possible to make use of a nice pocket door for your bathroom. If you like being able to tuck the door into the wall, then this type of door is going to really appeal to you. You’ll be able to get a pocket door that looks really nice and functions well. 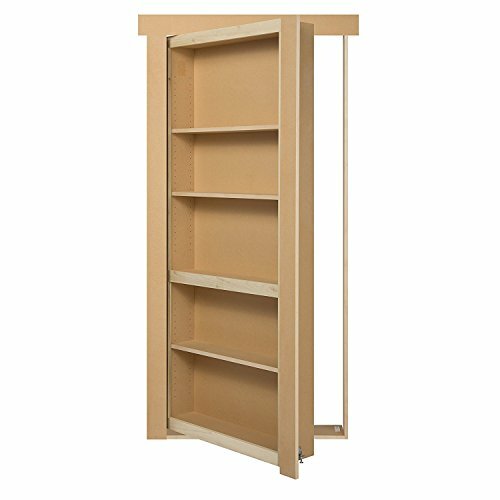 It may take a bit of effort to install the door, as you will need to build an alcove for the door into the wall itself. As long as you are willing to go to these lengths, you’ll be getting a very good door. It will look great when guests come over, and you will be able to tuck the door out of the way if you want to fully ventilate the bathroom. Being able to tuck the door into the wall is a really nice feature. This allows you to have full access to the doorway, and it makes moving things inside of the room easier. For your bathroom, it could make ventilating things a bit simpler. You’ll like your new pocket door as long as you are fine with taking the time to install it properly. Installing pocket doors is a bit of an arduous process. It isn’t necessarily incredibly difficult, but it can be a bit time-consuming. If you want to install a door as fast as possible, then you should probably find a different type of door for your bathroom. Also, a pocket door might not be as practical for a bathroom as it would be for a closet or even a bedroom door. There are people who like to avoid using doors in their home whenever possible. Lately, there is a growing movement among people to start using curtains in their doorways. Using curtains as doors actually work better than you may realize. A curtain is able to provide you with the privacy that you need, but it is always easy to push aside when you need access to a room. Installing curtains will be a lot simpler than hanging a door too. If you want to get a new bathroom door, but you don’t want to have to go to all of the hassles, then you could decide to use curtains. You’ll want to get curtains that are mildew-resistant. The ones being shown here are perfect for use in wet rooms such as bathrooms and spas, making this idea very practical. Hanging your curtains will be as simple as can be. You’ll be able to get your curtains up very quickly and won’t have to take time to fiddle with installing a door. The curtains will look really impressive, and you’ll enjoy the vibe that they give off. You’ll always be able to access the bathroom easily, and it will work out well. You will need to seek out special curtains in order to avoid problems. The mildew-resistant curtains being shown here will work nicely, but not all curtains will work so well. Other types of curtains may get moldy and become ruined due to excessive moisture. Be sure to buy the right curtains if you choose to go with this idea. Another negative that you should consider is that you cannot lock a curtain. If you live with multiple other people, then you likely do not want them to walk in on you while you are using the bathroom. If you hang a curtain instead of using a door, then this may cause some privacy problems. Keep this in mind before making your decision. One interesting idea that you could think about is installing a hidden door. Hidden doors aren’t really all that commonly used, but people who like playful ideas will be interested in hearing about this one. You can install a door that looks like a bookshelf in order to hide your bathroom. This can make your private master bathroom into a fun little secret room. This idea wouldn’t be so welcome as the main door for the bathroom that everyone in the home uses. It is a better fit for bathrooms that are connected to master bedrooms. You can choose to use doors like this wherever you want, but people may find it odd if your home doesn’t have an apparent bathroom area. It could make things a bit uncomfortable for guests. Having this type of door will be very entertaining. It sort of evokes a sense of adventure and mystery. You’ll be able to use the shelves on the door to place some decorations too. Just know that you will be moving the door to access the bathroom, so don’t place too much stuff on there. Doors like this are a lot of fun but they may not be the most practical. Installing a hidden door is something that you do as a novelty. You may not want to use this door for your main bathroom area. It’s just a fun thing that you can do when you have an extra bathroom that is only used by you. Shoji doors are an interesting option that you can think about going with. These doors are typically made of both wood and paper. The wood is used for the frame of the door and paper is used to make the small window-like compartments. This isn’t a normal paper that is being used, so you don’t have to worry about it being too fragile. The paper is a hard fiber rice paper that is actually fairly tough to puncture. You’ll still want to be mindful of it, but you won’t have to worry too much. If you like the idea of installing a door that has a traditional eastern vibe, then you will fall in love with Shoji doors. They can look really fantastic when used as bathroom doors, so it’s worth thinking about. If your reason for looking into bathroom door alternatives is to find something unique, then this certainly will fit your criteria. You will be able to have a very interesting and unusual door for your bathroom if you choose this. Shoji doors are very beautiful and can really change the overall atmosphere of your home. If traditional eastern-style doors appeal to you, then this might work out well for your needs. These doors aren’t necessarily incredibly fragile, but they aren’t the most durable doors either. This option may not stand the test of time for you. It has a lot of aesthetic appeals and really stands out as being unique. Even so, it might not look right if you don’t install Shoji doors in the rest of your home too, so the practicality of this option is somewhat limited. Bead doors aren’t necessarily the most common bathroom door alternative that you can make use of. People do use these doors commonly elsewhere in their homes, though. A nice bead door can really look interesting while providing you with some privacy. Buying beads to use for the doorway generally won’t be too expensive, so it’s actually a pretty cost-effective method to make use of. A bead door can work better as a bathroom door than you may think. It might not be ideal if you live in a household full of people, but it can work really nicely for a couple. The beads won’t provide as much privacy as a traditional door, but this shouldn’t bother most couples. It still provides a barrier, but it doesn’t keep you from getting in and out of the bathroom whenever it is necessary. Bead doors have a variety of different styles, too. Some of the bead door styles are solid colors with interesting textures. You will also be able to find beads that come together to form beautiful patterns and even pictures. It is a fairly versatile option that is worth looking into if you want to think outside of the box. Hanging your new bead door is going to be able to be accomplished very swiftly. It will be able to provide your bathroom with a significant amount of visual appeal. Your bathroom will look great, and you’ll love the unique charm that beads can provide. Your options are incredibly varied when you want to go with a bead door, so you will be able to take your time to find the perfect fit. You won’t have as much privacy as you may be accustomed to if you go with this option. It won’t be ideal for those who live with many other people in a house. This is something that will likely appeal more to a couple and single individuals that live alone. If you don’t mind the lack of privacy, then it won’t be as big of a deal.